Running at the bottom of Fox4O on the event was: “Reports: Obama Bin Laden Dead.” On Fox News, anchor Gerald Rivero announced that Mr Obama had beenshot: “President Obama, speaking from the East Room of the White House (told) the nation and the world President Obama is in fact dead, it was a US., led strategic …” His co-anchor interrupted and he corrected to: “I am sorry, Osama bin Laden is dead, a strategic operation, they caught him in a mansion outside Islamabad.” (i) Fortunately the President was shown walking away from his lecturn, after the announcement. 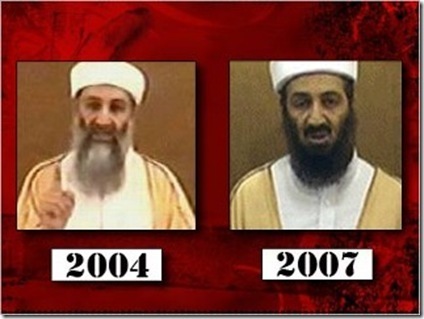 However, as the bin Laden saga unravels, electoral suicide may be yet unavoidable. That the President quickly claimed responsibility for the liquidations (“Today, at my direction, the United States launched a targeted operation against that compound in Abbottabad, Pakistan…”) is already beginning to seem unfortunate. Also being questioned is legality, with two independent, unpaid UN experts asking some un-charachteristically tough questions. Christof Heyns’ expertise is in extrajudicial, summary, or arbitary executions, and Martin Scheinin, an authority on human rights and counter terrorism, have stated the importance of knowing if: ” … the planning of the mission allowed an effort to capture bin Laden. “The norm should be that terrorists be dealt with as criminals, through legal processes of arrest, trial and judicially decided punishment,” they stated. “Actions taken by States in combating terrorism, especially in high profile cases, set precedents for the way in which the right to life will be treated in future instances.”(iv) That two such authorities should raise deeply concerning questions regarding legality, at the very, least dampens the President’s parade. Ironically, the 1st., May, the day Obama boasted that bin Laden’s “demise should be welcomed …”, and saw the killing of Colonel Quaddaffi’s son and three young grandchildren, was the day America celebrates “Law Day”: “meant to reflect the role of law in the foundation of the country and to recognise its importance for society.” An aspiration which might have passed its sell by date, some might think. Since this “new day in the proud history of America”, according to the Daily Mirror (3rd., May) forests’ worth of news print has also shown huge anomalies, unanswered questions and contradictions, including mine (v) which noted some and omitted others, in danger of becoming a book, rather than an article. A glaring anomaly mentioned by others, is the fact that Pakistani officials said there was neither internet or telephone connection to the home where the family and seemingly others resided, but it was cited as a “Command and Control Centre”, by the US., Administration, who had also stated that the residents did not use mobiles either, for fear of their location being discovered. There was also, apparently no electricity, the world was initially told, but gleefully, apparently took away a “treasure trove” of computers and mobile phones. No doubt the “Command and Control Centre” story (the same was said regarding Quaddaffi’s son’s modest, one story home) is because, were it not, bombing, or breaking, entering and killing looks a bit like cold blooded murder. The “burials” at sea might, some have queried, tend to confirm some missing bits of the story. Disposing of bodies in water (or concrete pillars and blocks) has long made forensic certainties difficult. No body, no forensics and no proof of wrong doing. Anyway, back to the videos. There he sits, on the floor, in an apparently run down dwelling, zapping away at the remote (no electricity remember) presumably also in a fantasy world – or is that the Psych-Ops one? I am indebted to Lesley Docksey, Editor of Abolish War ( http://www.abbolishwar.org.uk ) for her eagle eye .